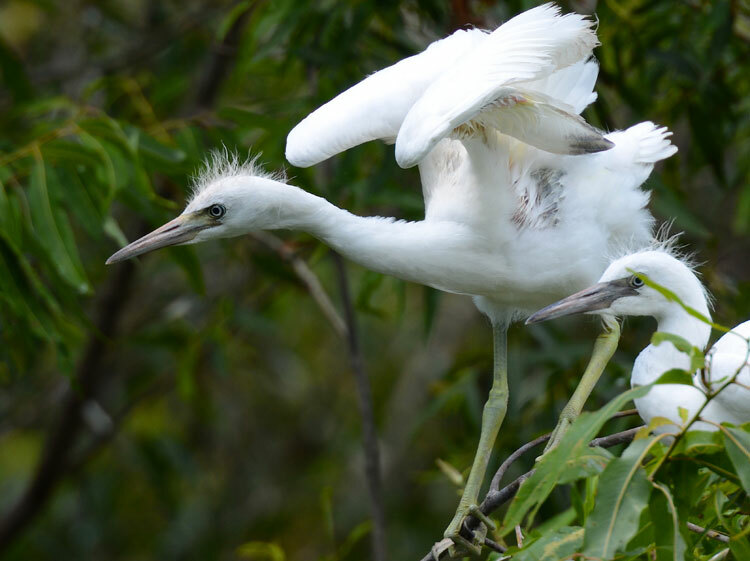 Two young Little Blue Herons stretch and flap their wings from branches near their nest. They were not yet airborne, still gaining strength for their first flights. Here they were watching an adult that had just landed a few branches over, no doubt hoping for food! Little Blue Herons have white plumage while they are young and retain the white color for their first year. 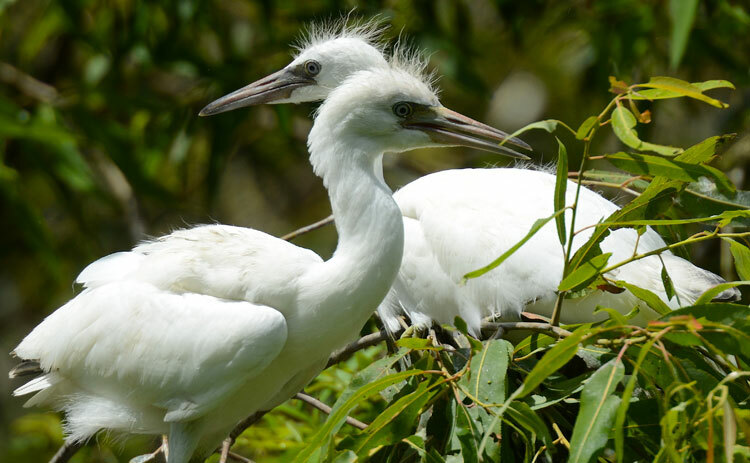 They often nest with Snowy Egrets, but it's not too hard to tell the two white birds apart. 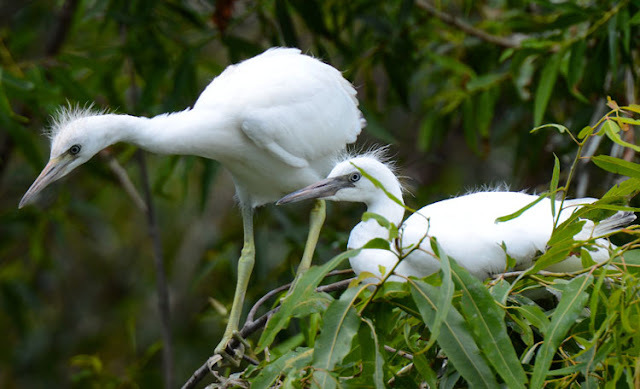 Look at their legs, Little Blue Heron babies have greenish legs and feet. They also have dark blue-gray tipped wing feathers. It's often hard to see the dark-tipped feathers when the birds are at rest, but when they stretch, it's easy to spot the dark tips on the wing feathers. ...still hoping and wishing for food! 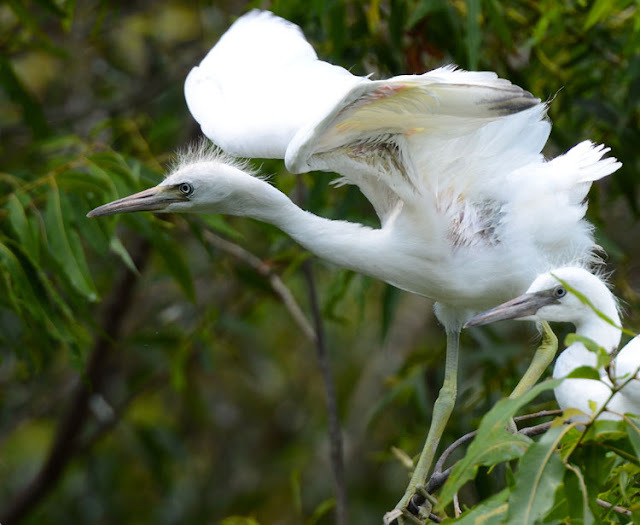 ...even with the wings folded and at rest, you can see one dark-tipped wing feather among all the white, identifying the bird as a Little Blue Heron. ...and here's papa fluffing up in all his blue grandeur! 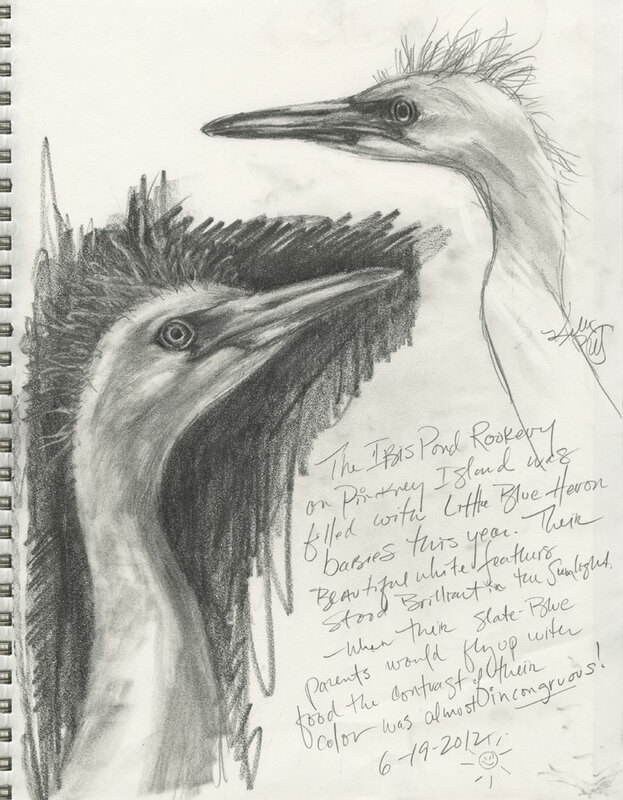 Stunning photos, Kelly, and superb sketches that capture the essence of those birds. The adult is absolutely magnificent! Hi there - what a great set of pictures. Remarkable how much a bird can change. I'd love you to link to this week's WBW - you can find a how to link section on the WBW tab at the top of my blog if you have never done this. Your Pinckney trips always are rewarding with fantastic up-close photography and artwork. Awesome Kelly!!! Great post Kelly!! I loved seeing the Little Blues at this age. Wonderful post and photos Kelly. Your sketches are stunning, so nice. 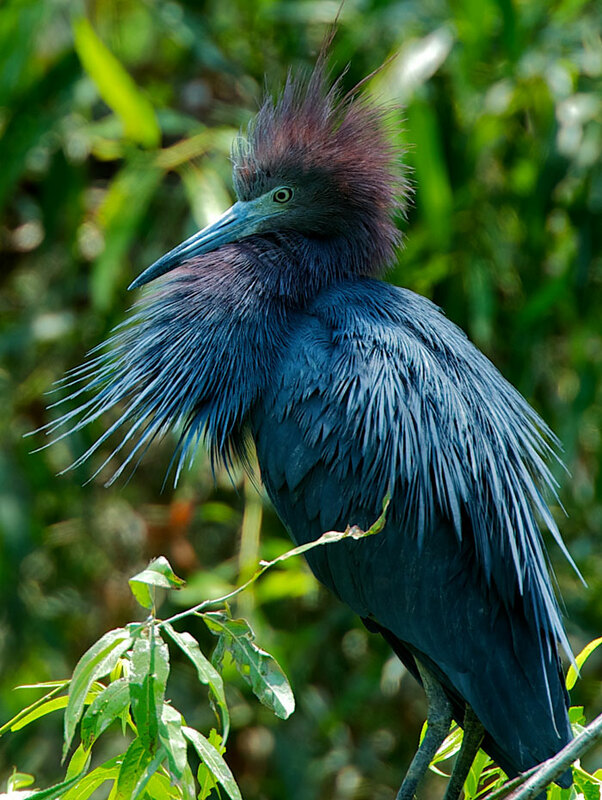 What a joy it must have been to observe these Little Blue Herons. You captured them beautifully in your fabulous photographs! Their sweet head sprouts make me smile. They certainly will grow up to be stunning birds. 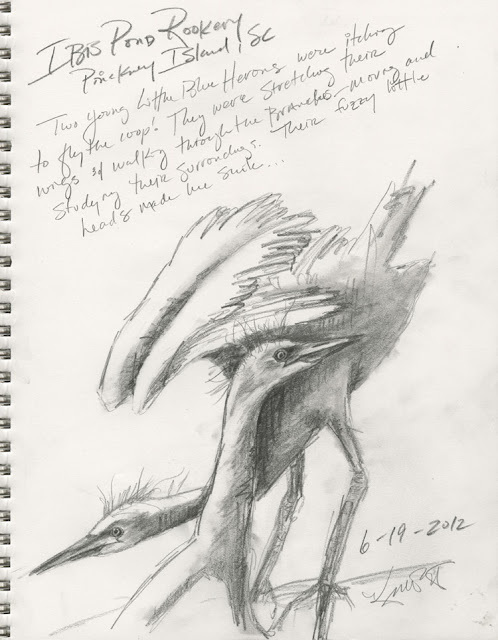 Outstanding sketches and photographs, Kelly! Awesome!!! You really captured the beauty of the little blues with your camera as well as your pencil. You are one talented lady! Love the photos and the drawings. Lovely post!